I first became aware of Kelly Rudnicki from her Food Allergy Mama blog and digging through her bevy of amazing recipes. She is brilliant in the kitchen and honestly loves the art of cooking. She even tests her recipes on her own children, so you know they are truly ‘kid-approved’! 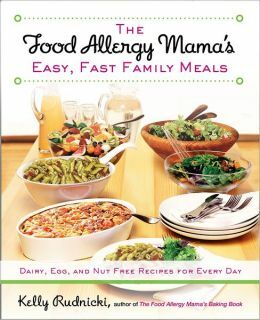 Her new cookbook The Food Allergy Mama’s Easy, Fast Family Meals is chock full of dairy, egg and nut free recipes for everyday. Rudnicki is not afraid to make mistakes. She stresses to her children that they don’t have to be perfect and allows them to embrace their creative side, just as she does. She has really jumped through hoops to create tastes that are in line with kids’ picky palettes. This means minimal spices and ingredients. Something you may not be aware of, or not sure how to go about it, is keeping the risk of cross-contamination away. Rudnicki shares a list of kitchen equipment you should have on hand and only use when preparing allergy-safe foods. Her photos make my mouth water (not to mention her family is adorable). Especially the seriously golden cheesy macaroni and her chocolate wonder waffles. The Food Allergy Mama’s recipes are all dairy, egg, and nut free, eliminating half of the common allergens. Did I mention they’re all quick and delicious? A fan favorite, pasta and turkey meatballs, is prepped and cooked in less than 30 minutes. Perfect for a busy family. 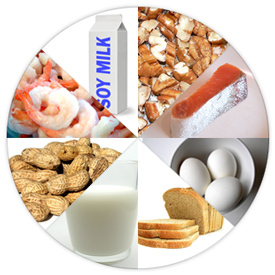 With 1 in 13 children affected by food allergies and rising, it’s nice to have healthy options for mealtime. A food reaction can range from a mild response, like an itchy mouth or skin, to a potentially deadly reaction like anaphylaxis. Remember, food and mealtime is a chance to create special memories for your children. They’ll always remember sitting and enjoying meals together and your cooking. It’s something that will stay with them as they grow and it will be a familiar comfort. ← Beat the Heat with My Favorite Frozen Treat! Emma's Mission is to ensure each and every child is given the necessary key fundamentals in order to grow and blossom into respectful, successful and happy individuals.